Troop 50 returned to Chewacla State Park's Civilian Conservation Corps Campsite for the Saugahatchee District's annual Frank Horky Spring Camporee. The troop joined five other troops and more than 120 Scouts and leaders from both the Saugahatchee and Muskogee Districts. Because the threat of rain kept most troops at home Friday night, Troop 50 spent a quiet evening in camp before getting up Saturday to welcome the arrival of its newest Boy Scouts, who recently joined from area Cub Scout packs, as well as to ready for the competitive events of the day. Some Scouts participated in the morning's emergency preparedness drill, which included a mock troop mobilization and first aid exercise. After lunch, the troop's two patrols competed in a variety of events testing Scouts' team-work skills while vying for the coveted Spring Camporee kudu horn. Bow Saw Relay, where Scouts used a bow saw correctly to cut a given number of wood medallions in the shortest amount of time. Robert leads the knot-tying portion of the Log Lift. Log Lift, where Scouts created a rope-and-pulley system to lift a log off the ground a certain height and hold for a given amount of time. The Turn Up Patrol attempts to help Louie "walk" the A-Frame. A-Frame Walk, where Scouts used a lashed-together “A-Frame” and a system of ropes to "walk" a given distance in the shortest amount of time. The Turn Ups safely deliver the hot isotope to the safe zone. Hot Isotope, requiring Scouts to move an item from point A to point B in the shortest amount of time using ropes, bungee cords, and coordinated teamwork. The patrol discusses strategy before beginning the Portage Race. Portage Race, through which Scouts toted a canoe and other given equipment through a pre-established course in the shortest amount of time. before the start of the campsite inspection. Campsite Inspection, where organization, cleanliness, and camping best-practices were evaluated and scored. Dutch Oven Cookoff, where Scouts' cast-iron culinary skills were put to the (taste) test. Animal Tracking, where Scouts tried to identify as many animal tracks as possible. While some of the troop departed to participate in the Pack 29 Arrow of Light Crossover Ceremony, others remained at the camporee to attend the awards campfire. The troop was recognized for a third-place finish in the Campsite Inspection, and the Turn Up Patrol placed first in the Bow Saw Relay and second in the Hot Isotope event. The troop reassembled after the campfire and crossover ceremony, settled in for the evening, and then the rain set in! Scouts and leaders awoke Sunday morning after several hours of rain, which continued through the time the troop departed camp. While rain marked the end to the second campout in a row, Scouts and leaders noted during the Patrol Leaders Council the following Monday evening that challenges such as those help the troop better prepare for future events. The PLC members also praised how everyone worked together as a team in the events, especially in welcoming our newest Scouts. To better prepare the newer Scouts and sharpen skills for seasoned Scouts, the next several troop meetings will focus on camping equipment, menu planning and food preparation, and other camping-related Scout skills. 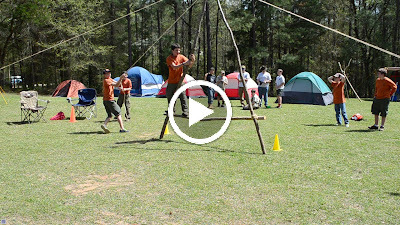 Find more photos and video from the Spring Camporee in the troop's online photo album.